oversupply of nutrients results to increased susceptibility of the crop to pests, lodging, etc. under supply and untimely application slows down the growth of seedlings, lower number of tillers, and lower grain weight. Nutrients from fertilizers must be used efficiently and effectively. Proper management of nutrients improves crop growth and yield. There should be no nutrient deficiency and toxicity symptoms from tillering to early panicle initiation and flowering stages that may impair the growth, development and yield of rice. 350 panicles/m2 in irrigated lowland for direct wet seeded rice. add the number of panicles and divide the total by 3 to get the average number of panicles/m2. Know and manage the nutrient requirement of your crop based on the available information, nutrient assessment and decision-support tools. 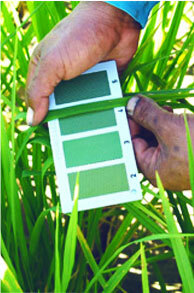 Manage the Nitrogen needs of your crop based on the leaf color chart (LCC). If the LCC reading is below 4 for transplanted rice and below 3 for direct wet-seeded rice, apply N fertilizer (1.5 bags urea per hectare in the dry season and 1 bag urea per hectare in the wet season) from tillering to early flowering stages. Aside from nutrient deficiency, consider mineral toxicity in deciding on the nutrients to apply. You can use other soil fertility assessment methods in assessing the nutrient status of the soil.